Unfortunately, for now at least, the browser plug-in is Windows only. While I've been promised that Mac OSX and Linux versions are coming soon, I'm really hoping that OSX support isn't limited to Firefox. For once, I'd like to see a Safari support out of the gate. Update: Brady Forrest has a good overview over on the O'Reilly Radar, while Dann Catt is poking around the internals over on Geobloggers. 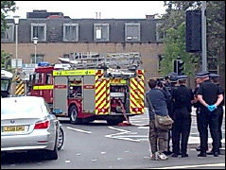 A 12:50 BST today a bomb went off in Exeter city centre. Around forty minutes afterwards, at 13:29 BST, my wife emailed me here in Italy to tell me about the blast. The news started showing up a few minutes later, at 13:44 BST and 13:55 BST, as the story was picked up by the local and national BBC news sites. My tweet hit Twitter about 15 minutes after one BBC tweet and about an hour ahead of the other. At 14:12 BST the Exeter press office sent out a University wide email to inform people that there had been an explosion in the city, and that media reports suggested it was caused by an explosive device, but that there is no reason to suggest that the University was at risk. Around the same time news stores started to appear as far afield as Plymouth and Turkey. The first pictures started to arrive around 13:40 BST, and by 14:55 BST there were twenty nine stories on Google News Search, reporting that there had been three blasts and that parts of the city had been evacuated including the Princesshay centre, Beford Sqare, High Street, Queen Street and Paris Street. I'd received a second email from my wife at 14:42 BST suggesting that the current theory was that the blast had been caused by a man with a nail bomb trying to commit suicide about ten minutes before I saw the Reuters story suggesting the same thing. By this point it had become clear that nobody other than the man that had set off the explosion had been injured in the incident and that although the possibility of other devices in the area could not be ruled out, there probably wasn't going to be any, and I could breathe again. As happened with the London bombings in 2005 it is obvious that there have been fundamental changes in the way that news propagates since 2001. Although in fairness to the BBC, my wife tells me that she found out about the explosion from the local news more or less at the same time as someone who'd been in the city centre rang the office next door to tell them about the blast. Although following that, most additional information they heard came from friends and family on the ground, rather from the mainstream news sites. I'd expect that over the next few hours, just like the 2005 blasts, I'll also be getting most of my news from non-mainstream sources. However unlike the 2005 bombing this, unless it turns out that the initial information is very wrong, is a local story and that means that, unlike a story of national interest, any follow up by the main stream press will be sporadic at best. They'll probably not just be the best news source, they might be the only news source available. So if you've been keeping up you'll know I have one of Three's new HSDPA USB modems on loan for review, and that I'm also currently out in Italy. After sorting out some teething troubles, the SIM card I have didn't come pre-activated for international roaming since it's a trial account, I've been using it fairly heavily. There is actually good coverage out here in Trieste, better in fact than I've seen in the UK in the past. Transfer speeds are pretty good, it's only noticeably slower than WiFi when you hit something like Google Maps which is heavy with AJAX and dynamic content. I have stumbled across one problem though. Interestingly, it looks like the email I'm sending when connected through the dongle is getting black holed by the SpamCop, SORBS and NJABL lists. Looking at the SpamCop entry for the pool address I was using it has been listed 17 times for a total of 69.4 days in the last 71 days. Most the other IP addresses in the same block have also been listed. In other words, it looks like a lot of Three's dynamic IP pool is listed as a source of spam. That's bad news. Certainly anyone who sent me email that got flagged as coming from an IP address which is on one, or in this case more than one, real-time blackhole list stands a poor chance of me ever actually seeing the message unless they're on my mail client's white list. Since my white list basically consists of my boss and my wife, and not necessarily in that order, it's unlikely that will help them that much. I travel a lot, anyone that sticks around here for any length of time knows that, and if you're also following my tweets you'll know I'm current in Italy. Despite this, most of the traveling I do is actually trans-Atlantic. I'm a regular on the LHR to SFO and LAX routes and have spent more time than I care to recall watching "Godthab", the sole point of interest for at least a thousand miles, slowly move across the in-flight tracking display on the seatback video screen. I might do the Atlantic run anything from three to five times a year. This year, barring emergencies, I'll have watched Godthab slide across the screen another eight times before the year draws to a close. That's a lot of time unemployed over Greenland. Except that I'm not, unemployed that is, Paul Graham talks about avoiding distractions and, at least for now, thirty thousand feet over Greenland is one of the few places in the world with no distractions. Despite the fact that I spend most of my time watching in-flight movies, sometimes the same movie back-to-back several times in a row, when the boredom finally sets in properly, I spend my time thinking. Which is what I'm paid to do after all, but with all the distractions, have very little time for these days. Short haul flights just don't offer the same opportunity for boredom, and then after you arrive on the ground you have less opportunity for more boredom. If you're eight or ten hours out of your own normal time zone people seem to reduce the amount of irrelevant stuff they send your way. If you get email, its generally urgent, and they stop phoning you almost entirely. This doesn't happen if you've taken a short hop out of GMT and into CET. For some reason people think that you should be holding up your normal work load on top of whatever all day meeting you're squirreled away in this time. Meetings, under any sensible definition of the word, aren't work. However they do take up as much time as real work, if not more. I definitely count most meetings as a distraction from getting work done. As well as traveling too much, I go to too many meetings. I'd really like to restrict the meetings I go to down to those that get stuff done, and hopefully the meeting I'm sitting in now will count as one of those. Distractions are easy to come by, for instance I just spent twenty minutes writing this blog post, mainly because I want to tell people about my growing obsession with Godthab. That, and in-flight tracking, was what I was thinking about on the short haul flights that got me here after all. Three and (not mobile) broadband? I was interested to spot (via 3mobilebuzz) that Three is thinking about rolling out a line of home routers which, instead of connecting you to the Internet via a land line ADSL connection, instead provide your home broadband via their 3G network. To be clear, we're not talking about a femtocell, which uses your existing landline broadband to provide a cell base station, and allows networks to extend their coverage indoors, or other places where their coverage is limited or just plain unavailable. In fact what we're talking about here is exactly the opposite of a femtocell. Such a device would have its own SIM card, and then share its 3G conneciton to the Internet over a local wired and wireless network. This is interesting, and not an idea I've come across before. Of course, with only spotty coverage on any of the networks in the out of the way village I live in, such a device isn't going to be on my shopping list. I'd be much better off with a femtocell, and when they finally (if ever) come onto the market I'll be the first in line, no matter which of the UK networks are offering it. However as someone that does drop off grid in some weird and wonderful places from time to time, I can see the attraction of this anti-femtocell. MS WorldWide Telescope for Mac? While it is more common in the US, I don't think I know a single British astronomer that owns a Windows box outside of the VO community. In fact someone else here at Exeter said that Roy's quote caused them an "...ironic chuckle". Which is pretty much how WWT has been received. Nobody here can try it because nobody has a Windows machine, we either run Linux or OSX. Update: Looks like I'm not the only one a bit underwhelmed by the "Mac version" of WWT. Despite not being an official standard the Plastic protocol is one of the more obvious success stories of the Virtual Observatory effort. While it had its flaws, Plastic was easy to implement, and was quickly adopted as the lingua franca for client-side tools to talk to each other. However in the run up to the Trieste meeting the draft SAMP standard has been released into the wild for comments. SAMP, that's Simple Application Messaging Protocol, is the official successor to the grassroots Plastic standard and shares a lot of common influences and a fair number of the developers. Over the last few days I've put together a first cut at a prototype SAMP Hub, which will probably eventually after a lot more polishing become one of the reference implementations for the standard, along with some testbed clients. In the past I've posted about various Plastic and Google related hacks, so its perhaps unsurprising that the first post about SAMP is Google related, and still involves a bit of so called tupperware. To prove to myself that the prototype Hub is actually (sort of) working I've put together a Plastic to SAMP gateway, and a SAMP facade application for Google Sky. After all, I can't go to an IVOA meeting without some sort of gee whiz demo, can I? The death of the desktop, the end of the Internet? With the publication of his new book, "The Future of the Internet: And How to Stop It", Johnathan Zittrain has started a debate amoungst the great and the good. People suddenly seem to be getting worried that gadgets are killing the Internet and that the iPhone might murder the web. He argues that today's technological market is dominated by two contrasting business models: the generative and the non-generative. The first model, general purpose computers, allow third parties to build upon and share through them. The second, non-generative model, is more restricted, with appliances that can only be modified by the vendor. He is very much afraid that the second model, where we are locked in by vendors is coming to predominate. Well first of all I think he's just plain wrong, you only have to look at appliances like the Linksys NSLU2 or even the iPhone, which is oddly enough seems to be being held up as the poster child for vendor lock in, to see that we aren't being locked in by these devices at all. Or at least, some of us aren't. I think he's right in one respect, I think we're entering a period where the number of people that can hack on the devices we use to talk to the network is going to become smaller. Which is why I argued that we're entering a period of change, it's not that we're being locked into devices, it's that the people with the skills to hack on the devices are changing. Out of the existing infrastructure, the idea of network neutrality is the important thing to hang onto. I'm far more worried about the possible loss of that, than I am about information silos or Facebook. With open hardware like the Arduino arriving we've been given a new tool. In the same way the arrival of the desktop computer changed everything, the growing availability of open source hardware will do it again. Peter should drink some of his own Kool-Aid. In its place I think we're looking at the arrival of something much more interesting, a pervasive information architecture. The New York Times (via Slashdot) carried an article recently talking about embedded devices, but there is an important distinction to be drawn between these and ubiquitous computing, where you have a pervasive architecture of computing devices. Between independent gadgets responding to simple environmental conditions, and a pervasive information architecture shared across a number of ubiquitous computing devices. When the web came along and changed everything, I was really surprised that I was going to get to live through such a change. After all the desktop computer had only come along a few years before, it had changed everything, and while my first computer was a PDP-11 I was a bit too young to really appreciate what had happened at the time. Now I get to live through yet another huge change in the way the world works, people like Chris Anderson are quietly making it happen. If you haven't been following along Chris has been quietly scratching his itch and building autonomous UAV.